Efficient high quality output for busy workgroups and small departments, this smart multifunctional will enhance your document workflows and safeguard confidential information. 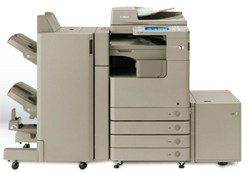 The imageRUNNER ADVANCE 4225i will handle the workloads of your busy workgroups and departments, thanks to its robust design, fast output speeds, automatic finishing and up to 4,980 sheet paper capacity. The colour touch-screen, intuitive menus and smart user authentication provides you with unprecedented ease of use. Documents can be quickly scanned, secured, signed, tracked, archived and sent to a variety of destinations in a range of formats. All imageRUNNER ADVANCE devices integrate directly with a range of powerful document output and management software providing you with end to end document process optimisation. Award-winning¹ smart user authentication puts you in control of user access and rights, while providing visibility and activity tracking through reporting. To reduce management costs, this multifunctional device provides you the functionality of multiple devices in a single unit and can be managed consistently as part of a fleet of imageRUNNER ADVANCE devices. uniFLOW software offers further efficiencies through cost centre selection, print job redirection and detailed reporting..
Support for industry standards combined with imageRUNNER ADVANCE’s powerful MEAP platform ensures seamless integration into your IT environment and a tight link with Canon’s award-winning range of document solutions². The consistent imageRUNNER ADVANCE platform and management tools allow you to centrally and efficiently configure, manage and upgrade your device, whether individually, or as part of a larger fleet, as well as to monitor, report and diagnose for proactive and efficient maintenance.